While I do admit that some variance is unavoidable in a beer that utilizes 11 different hops even though the recipe is static, I contend that Enjoy By is the perfect choice for this experiment (and not just because I already conducted it). turnover. That, of course, also assumes the brewery release schedule allows for multiple batches throughout the year. Reason Zwei: Enjoy By is released several times a year, at generally set times, and is a fantastic IPA. All are features that make it desirable to sample every available PA batch fresh and pick the ones with the most consistent flavor profiles. Based on what I tried, I found the fresh editions of 02.14.14, 10.31.14, and 12.26.14 to be the most similar with only minor variance. Reason Drei: Enjoy By isn’t a timid IPA that is more malt than hops. It’s a high alpha acid beer whose whole existence is based on the concept of a dank, aromatic, fresher than fresh IPA. The point of this experiment in IPA oxidation is to taste how quickly and to what degree hop alpha acids and oils break down with time. Seems like a perfect match to me. Reason Vier: To a lesser degree, I can shed some light on just how much of a gimmick this ultra-fresh IPA from Stone really is or if a beer named after a best by date has some merit. This isn’t my intent, but I suppose it’s a byproduct of using Enjoy By. There we have it. If further justifications are needed, I don’t have them, so let’s get to it and see just what father time does to one of my favorite IPAs. I find that my opinion matches up pretty well with what I like, but people might want to hear from more than just my taste buds. To that end, I recruited four other beer drinkers of varying beer backgrounds to partake in this mad science of beer drinking and provide a fuller picture. That, and so I wouldn’t pickle my liver trying to polish off 72 oz of near 10% beer by myself. I used our collective thoughts and feedback for the results below. While I didn’t have time to write this up until recently, this tasting was conducted on 12/07/14. Note: I invoke the name of science for the beer abuse that is to follow. Beer was harmed in the writing of this article, and for that, my sincerest apologizes to Stone and its fine assortment of craft beers. 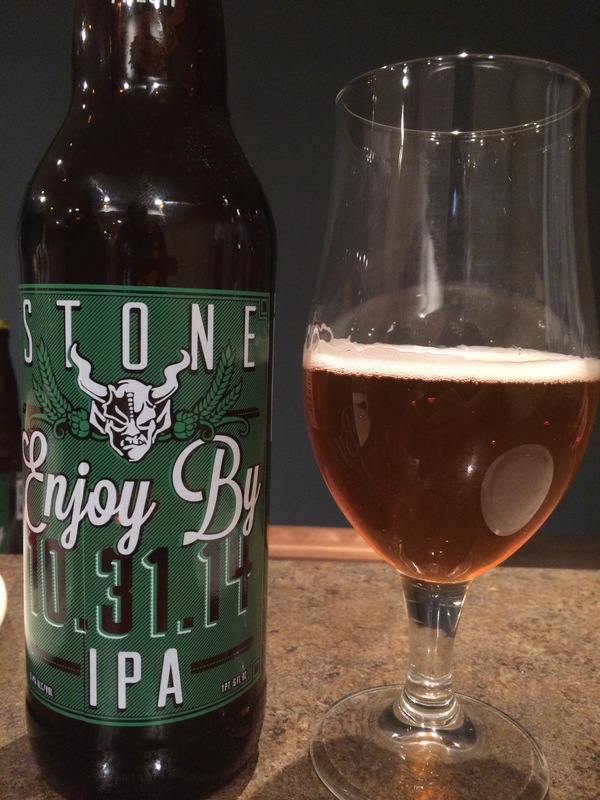 Stone, it’s what’s for liver™. Distribution: Varies by release, check the Website to see if your state is included (here). 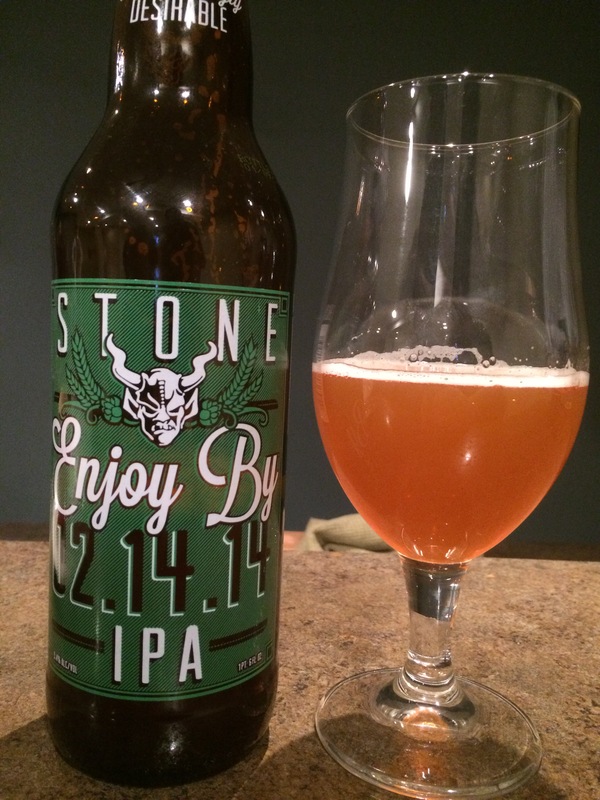 Information: For more detailed information, check out my video review – (Stone’s Enjoy By – 02.14.14 Review). Appearance: Just look at it. I may not take the meanest cellphone picture and might have gone temporarily blind while lighting it, but even my terrible effort shows a beer worthy of framing. It has that great coppery amber clarity that I come to expect from Enjoy By. A clear, shimmering beauty of a beer and one to admire. Aroma: Citrus/tropical fruit, resin, tangy booze and a toasty dank that is freakin’ fantastic. Fresh, clean and a dose of nose tickling Pin-Sol. You clearly smell the hefty, intense hop bill that makes this IPA stand out. Taste: Crisp, peachy resin, mango, and a sweet malty middle wrapped in a dank hop cone. There is some soapy floral bitterness on the finish, but a great, clean tasting beer. Opposite of the New England dank that adds an even toaster grain bill and deeper body, but revels in the West Coast dank of citrusy grapefruit notes and mild, fresh cut grass. Appearance: The clarity and color are largely unchanged here. When compared to the glass of 12/26, it’s slightly darker brown with a minor hit to the clarity. Viewed on its own, few would notice a difference. If it’s younger brother is a masterwork that deserves a place in the Louvre of beer, this one is a forgery worthy of a metropolitan art gallery. Aroma: Lemon peel, sweet tropical fruits, and sugary malt, but a bit flat compared to the 12/26. The dank is gone, as is the resin and toasty qualities. It’s a good aroma if you like your IPAs on the bitter grapefruit side or the sweeter elements to pop. Taste: The mouth feel has the oily/slick quality of an IPL, but the carbonation is unchanged. The malt comes through more, providing a flat undercurrent of sweet sloshing around under a flair of citrusy lemon/grapefruit and a hint of resin, The finish leaves a bland bitterness that coats the tongue. 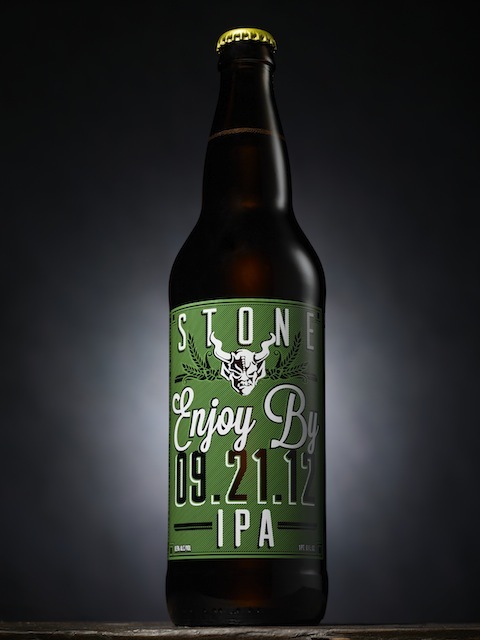 10/31 still has the recognizable taste profile of Enjoy By overall, but this is a simplified beast that lacks alpha bite. Appearance: It’s pretty obvious that time has not been kind to the 02/14. It’s recognizable as a beer, but holds no resemblance to Enjoy By. The clarity is long gone, leaving an amber cloud of hazy murk in its wake. When compared to its brothers, this is a sloppy reproduction on crushed velvet hung in the bathroom of a Taco Bell. Hard to believe it’s from the same pedigree of beers. Aroma: The smell of lemons has a tinge of orange on it and a strong sugar emphasis. The citrus/grapefruit qualities have collapsed and now fully resemble astringent cleaning chemicals. Any hints of tropical fruits or resin has been excised. This flat, boring bouquet of bland couldn’t be further from the 12/26. Taste: Very soft mouthful of fluffy bubbles rather than the crisp bite of standard Enjoy By. The oxidation crushed any esters this beer once had, leaving an intense, bitter lemon as the only survivor. A malty sweet front hits a flair of bland bitterness before a dry, soapy finish. It’s as if you’ve ripped the the sugary malt and spiky bitterness from Mikkerller’s 1000 IBU beer, filtered it through a cardboard box, and drank it alone in the middle of a sadness room. A drop-off was expected, but this is a cliff dive into a quarry. Before undertaking this simple experiment and setting out to purposely ruin a darling of the beer world, I didn’t anticipate just how severely and efficiently time would destroy an IPA. The progression from the bright, fresh, and fruity dank 12/26 to the mellowed but palatable 10/31 and finishing on the 02/14, a lump of boozy, chemical tasting hop water, was a mind opener. I thought the differences between each would be apparent but subtler, requiring near a year or more to really introduce compelling changes. Granted, the time difference between the 02/14 and 10/31 isn’t insignificant, but the 02/14 tasted as if it was raised from the Titanic. Not that you needed me to verify this, but Enjoy By is no gimmick. Respect the date! Armed with these results, I plan on conducting this experiment again and taking it a step further. I’ll follow the same steps but with multiple releases to see if I can pinpoint just where the experience goes drastically wrong. To add another layer, I’ll age two bottles of each release, one cellared and one refrigerated. This way, I’ll be able to not only taste the effects of aging, but how well refrigeration preserves those essential fresh hop oils and acids. That’ll be some work, but why just drink beer when you can drink with purpose? Till then! 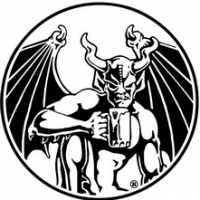 Check Out Part 1: The Why Not of Aging IPAs – Science! Strong work and a very enjoyable read. I bought a few bottles of 12/25/15 last year and one disappeared, so I assumed someone poached it. But just came now, nearly a year later, to find that it somehow got burried in the back of the fridge. I’ll probably still try it, maybe even send you the results to add some power to your study. 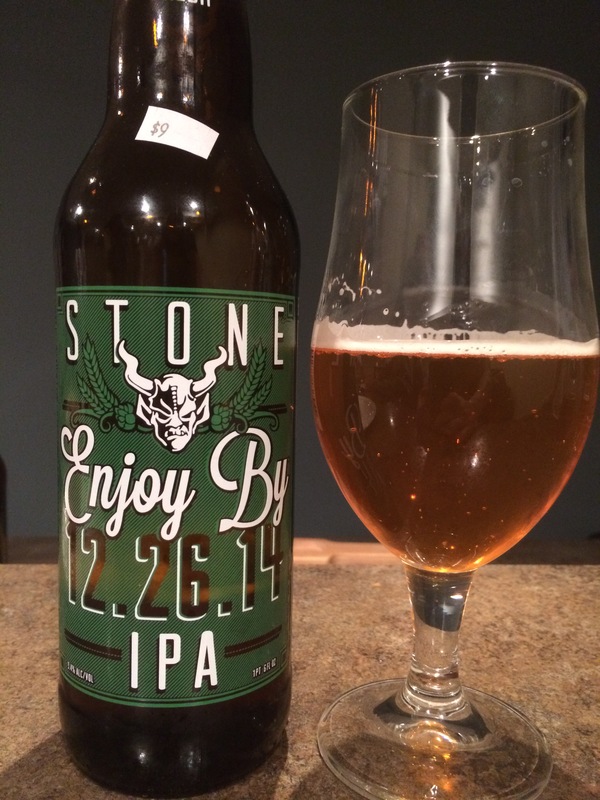 But thanks for the article – even though it may have crushed my dreams that the 9.4 abv would protect it from decay.